ALL RELATIVELY AFFORDABLE. THE NMRA'S COYOTE STOCK CLASS IS OPEN TO 1954 AND NEWER FIVE LITER POWERED FORD VEHICLES. FORD PRODUCTION OEM SEALED ENGINE. THERE ARE SEVERAL BOLT CAPS LIKE THIS ON THE ENGINE TO KEEP IT CLOSED. 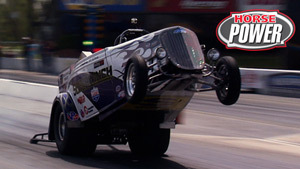 THEY RUN IT ON A 400 PRO TREE AND EACH CAR MUST WEIGH 3,150 POUNDS. 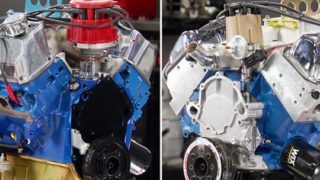 FORD RACING'S FIVE LITER COYOTE ENGINE, LIKE THE ONE WE'RE INSTALLING, IS PERFECT FOR THE RACE CLASS BECAUSE OF ITS STURDY BUT LIGHT WEIGHT STRUCTURE. (JESSE)>> SO WE HAVE ALL THE STRENGTH, IN FACT MORE STRENGTH THAN ANY FOURSIX BLOCK WE'VE EVER DEVELOPED, BUT AT THE SAME TIME WE'RE ABLE TO HAVE THESE CAVITIES WHERE WE TOOK THIS MATERIAL OUT, AND WE HAVE POCKETS WHERE WE DON'T NEED THE MATERIAL. WE HAVE ALL THE STRENGTH WITH THE DESIGN OF THE BLOCK. HE WAS A TEENAGER BUT HIS RACING LIFE'S ABOUT TO CHANGE. GOING FROM BRACKET WITH A 331 TO A HEADS UP CLASS WITH A NEW SEALED COYOTE THAT CAN'T BE MODIFIED. 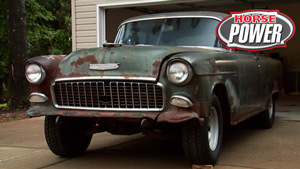 (JEFF)>> EVERYBODY'S GOT THE SAME MOTOR, JUST A FEW VARIATIONS OF TRANSMISSIONS. IT'S ALL GONNA BE SO CLOSE TOGETHER THAT IT'S GONNA BE DRIVER ERROR AND WHO CAN ACTUALLY TUNE A RACE CAR THE BEST. SO A LITTLE DIFFERENT FROM BRACKET RACING WHERE USUALLY THE FASTEST CAR DOESN'T ALWAYS WIN. 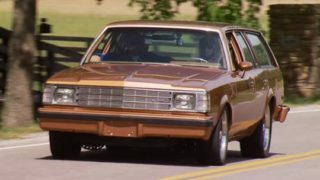 (JOE)>> JEFF'S LX STILL HAS THE ORIGINAL PAINT AND IT'S BY FAR ONE OF THE CLEANEST FOX BODIES WE'VE HAD AROUND HERE. OF COURSE FOR THIS BUILD UP THERE IS A PRICE TO PAY. JEFF'S GOT TO PITCH IN AND DO SOME WORK. TO THE SHIFTER CABLE. NOW WE CAN DISCONNECT THE FRONT BRAKE LINES. (JEFF)>> THAT SHOULD BE IT. 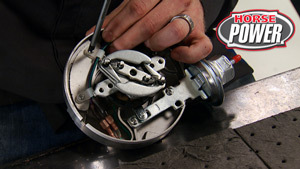 (MIKE)>> ALRIGHT, LOWER THE CAR TO SUPPORT THE TRANSMISSION WITH A JACK, AND REMOVE THE CROSS MEMBER BOLTS. WITH ANOTHER JACK UNDER THE KMEMBER WE CAN REMOVE THE SIX BOLTS AND LET IT REST. (JEFF)>> ALRIGHT THAT'S WHAT WE WANTED. IN ANY OTHER MANNER. NOW THIS ONE CAME TO US FROM UPR PRODUCTS AND THEY USE SEAMLESS CHROMOLY TUBING AND THEY TIG WELD EVERYTHING TOGETHER IN A JIG. NOW THIS THING IS GOING TO SAVE YOU ABOUT 70 POUNDS WHEN YOU SWAP FROM A FACTORY KMEMBER. 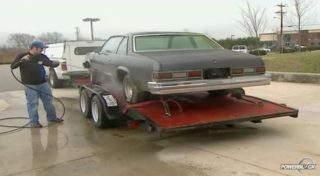 IT'S ALSO GOING TO MOUNT OUR COYOTE STOCK ENGINE IN THE SAME LOCATION AS A SMALL BLOCK FORD. OUR KIT CAM WITH CONTROL ARMS THAT WE'LL MOUNT TO THE KMEMBER USING THE SUPPLIED HARDWARE. IT'S TIME TO MOUNT THE ENGINE. THE URETHANE ONES WE HAVE ARE INCORRECT. SO WE'LL USE THESE UNTIL THE BIG BROWN TRUCK ARRIVES. 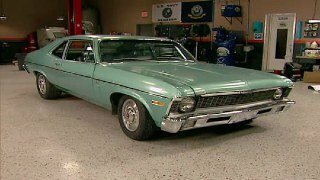 (JOE)>> YOU CAN RUN EITHER AN AUTOMATIC OR A MANUAL TRANSMISSION IN THIS CLASS, BUT THE AUTOMATICS ALL HAVE TO BE CFOURS. 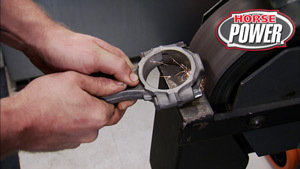 NOW OF COURSE YOU WANT ONE THAT'S GOING TO SOAK UP THE LEAST AMOUNT OF HORSEPOWER, WELL LIKE THIS ONE WE GOT FROM PTC. NOW IT'S A CFOUR STOCKER AND INSIDE IT'S GOT LIGHTWEIGHT REVERSE DRUM AND SUN SHELL. PLUS OTHER GOODIES LIKE ROLLER BEARINGS, AND RED CLUTCHES, AND RED BAND, AND WELL CHECK OUT THE DEEP PAN ON IT. THE INPUT SHAFT'S BEEN HARDENED AND THIS EIGHT INCH CONVERTER ALSO FROM PTC IS A LIGHTWEIGHT SETUP THAT SHOULD FLASH AROUND 5,500 RPM. OH ONE MORE THING, IT'S GOT A PRO TREE TRANS BRAKE INSTALLED TO THROW JEFF BACK IN HIS SEAT. (MIKE)>> NOW WE CAN ROLL THE POWERTRAIN ASSEMBLY UNDER THE CAR AND STABILIZE IT. WE CAN REMOVE THE CHERRY PICKER FOR NOW, THEN LOWER THE CAR ENOUGH TO REPOSITION THE CHERRY PICKER. (JEFF)>> ALRIGHT LETS COME UP WITH IT. 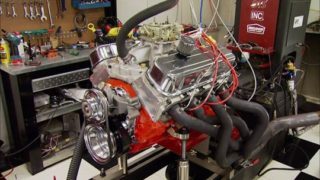 (MIKE)>> AND LIFT THE ENGINE INTO PLACE. (JEFF)>> YEAH LETS GO WITH MOTOR AND BOTH OF THEM. (MIKE)>> OH OKAY, I'M GOOD. WITH THE BOLT STARTED IN THE DRIVER'S SIDE, WE'LL USE A JACK UNDER THE PASSENGER SIDE KMEMBER. THE WHOLE KMEMBER NEEDS TO COME TO MY SIDE OF THE CAR. HERE WE GO. IT TAKES A LITTLE MUSCLE AND LEVERAGE TO ALIGN THE HOLES. (JEFF)>> THERE WE GO, I JUST TURNED IT OVER. (MIKE)>> AND I ACTUALLY SAW IN ONE OF THE FORMS THAT YOU CAN'T PUT THE KMEMBER WITH THE COYOTE IN FROM THE BOTTOM BECAUSE IT'S SO WIDE. (MIKE)>> WE JUST PROVED THEM WRONG. LOOKS GOOD! THAT'S IT FOR THE ENGINE AND TRANS. GETS WHAT GETS REPLACED NEXT IN OUR BUILD UP? (JOE)>> COYOTE, A MEXICAN SPANISH WORD MEANING TRICKSTER. MODERN DEFINITIONS, MASCULINE, OPPORTUNISTIC, PERSISTENT HUNTER, AND WE AGREE. THEY USE A PIECE OF EIGHTH INCH LASER CUT STEEL THAT'S TRIANGULATED OUT OF ONE PIECE FOR THE BACK OF THE HOUSING. THEN THEY WELD ON A THREEEIGHTHS THICK FACE PLATE TO MOUNT THE CHUNK TO FOR ADDED STRENGTH, AND IT'S GOT INTERNAL GUSSETING. WELDED TO THAT ARE THREE INCH AXLE TUBES WITH A QUARTER INCH WALL THICKNESS. MATING SURFACE, WE'LL DROP ON THE GASKET AND ADD A LITTLE MORE OF THAT RTV TO THE OUTSIDE. NOW MOSIER SPOOLS REDUCE DEFLECTION IN THE CASE AND ELIMINATE THE POSSIBILITY OF SIDE GEAR FAILURE. TO CINCH IT DOWN SOME LOCTITE 243 THREAD SEALANT, THEN WASHERS AND NUTS. MOSIER ALSO SUPPLIED THE CUSTOM ALLOY AXLES. NOW THEY BEEN LIGHTENED BY GUN DRILLING THE SHAFTS AND THE ROUND AXLE FLANGES HAVE BEEN STAR CUT TO HELP REMOVE MORE WEIGHT. THEY'VE BEEN INDUCTION HEAT TREATED TO OPTIMIZE TORSIONAL STRENGTH AND EVERYTHING IS DONE IN THE USA. STRENGTH ALLOY ROD ENDS. NOW THESE UPPERS ALSO HAVE A DOUBLE REENFORCED QUARTER INCH HOUSING BRACKET. FIRST THING TO GO ON ARE THE ANODIZED CALIPER BRACKETS. WITH A LAYER OF GREASE ON THE SPINDLE, THE ROTOR ASSEMBLY CAN MEET ITS NEW HOME, FOLLOWED BY A SPINDLE WASHER, NUT, RETAINER, COTTER PIN, AND FINALLY THE CAP. NOW THE CALIPER CAN BE ATTACHED WITH A 35 THOUSANDTHS WASHER BETWEEN IT AND THE BRACKET. THE BRAKE PADS GO IN NEXT, AND TO HOLD THEM INTO PLACE A RETAINER CLIP. OUT BACK, TO RETAIN THE AXLES AND THE MNINE HOUSING, BRACKETS THAT BOLT TO THE HOUSING FLANGE THAT ALSO DOUBLE AS CALIPER BRACKETS. IT CAME FROM WILWOOD ALONG WITH A TWO PIECE, 11 INCH DRILLED ROTOR. FOUR PISTON DYNOLITE CALIPERS WILL BE USED OUT BACK AS WELL. ONCE THE PADS AND RETAINER CLIPS ARE IN, THE BRAKES ARE ON, BUT THERE'S A LONG WAY TO GO. THE RACK WITH HARDWARE FROM THE KMEMBER KIT. WHEN A CAR GET LOWERED YOU INTRODUCE MORE BUMP STEER. NOW EVERY CAR HAS IT AND WHAT BUMP STEER IS IS A CHANGE IN TOE AS THE SUSPENSION MOVES UP AND DOWN. THE CAR SQUARE IN THE LANE. NOW WHAT WE'RE GONNA DO TO CORRECT IT IS PUT ON A STEEDA BUMP STEER KIT FROM SUMMIT RACING. WITH THE SPINDLES SQUARE TO EACH OTHER, ATTACH THE THREADED ADJUSTERS TO THE RACK. NOW SLIDE THE STUDS TAPERED END INTO THE SPINDLE. USE SPACERS TO ALIGN THE TIE RODS PARALLEL WITH THE CONTROL ARM. ATTACH THE TIE ROD, AND SNUG EVERYTHING DOWN. QUARTER INCH DIAMETERS. NOW COOKS MAKES THESE CLASS LEGAL LONG TUBES USING 18 GAUGE 304 STAINLESS STEEL. THEY DUMP INTO THREE INCH COLLECTORS. THEY'RE MADE TO USE ONLY WITH THE UPR KMEMBER LIKE OURS. AND JUST SO YOU KNOW, THEY ONLY WEIGHT 35 POUNDS. 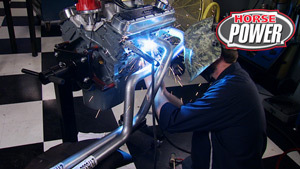 (MIKE)>> USING THE FACTORY MANIFOLD GASKET, THE HEADER CAN BE POSITIONED ONTO THE STUDS AND TIGHTENED DOWN. NOW CHECK THIS OUT. THIS IS AN EXAMPLE OF GREAT ENGINEERING. LOOK HOW THE TUBES RUN IN AND OUT OF THE KMEMBER WITH PLENTY OF CLEARANCE EVERYWHERE. FROM THE HEADERS BACK WE HAD TO FAB OUR OWN EXHAUST. NOW WE'RE USING MAGNAFLOW THREE INCH STAINLESS PIPE. 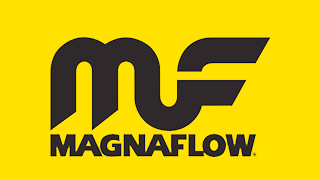 WE HAVE TO RUN A MUFFLER, AND FOR THAT A MAGNAFLOW SIX INCH RACE PIECE WITH THREE INCH INLETS AND OUTLETS. GET THE TANK INSTALLED. WE'RE GOING TO USE LIZARD SKIN'S CERAMIC INSULATION TO SPRAY THE AEROMOTIVE DIRECT REPLACEMENT TANK. WE'RE NOT ALLOW TO COOL THE FUEL BY ARTIFICIAL MEANS, LIKE USING ICE OR NITROUS, BUT WE CAN KEEP THE HEAT OUT BY SPRAYING THIS COATING THAT USES ACRYLIC BINDERS AND CERAMIC INSULATION PARTICLES THAT WILL REDUCE HEAT BY 30 PERCENT. AN AEROMOTIVE A-1,000 PUMP WILL FEED THE COYOTE, AND PUMP REQUIRES AND RETURN STYLE REGULATOR AND WILL SUPPLY THE COYOTE WITH MORE THAN ENOUGH FUEL. THE DRIVESHAFT IS FROM DENNY'S DRIVESHAFTS. NOW IT'S THREE AND A HALF INCHES IN DIAMETER AND MADE OUT OF 6061 TSIX ALUMINUM. 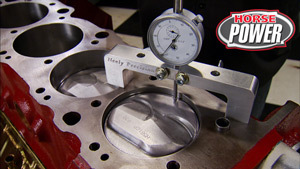 IT COMES COMPLETE AND WAS BALANCED TO 7,200 RPM, WHICH NOT TOO MANY PEOPLE CAN DO. AND THAT'LL GUARANTEE A SMOOTH RIDE WITH NO VIBRATION, AND THAT'S IT FOR THE UNDERSIDE. (JOE)>> WE'RE BACK AND CLOSE TO ADDING ONE MORE COYOTE RACER TO THE PACK. 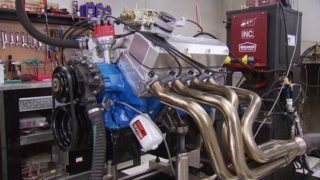 MORE VOLTAGE TO GIVE A STRONGER FLAME FRONT TO THE SPARK PLUG, ALLOWS THE FUEL PUMP AND INJECTORS TO WORK MORE EFFICIENTLY, AND ALL THAT ADDS UP TO MORE HORSEPOWER. IT WEIGHTS IN AT 11 POUNDS AND IS RATED AT 12.9 VOLTS, NOT 12 VOLTS LIKE THE STANDARD LEAD UNITS. NOW IN A CLASS LIKE COYOTE STOCK, WE NEED EVERY ADVANTAGE WE CAN GET. BORN FROM JOE GIBBS RACING, THIS FIVEW-20 FR-20 DRIVEN RACING OIL WILL INSURE OUR COYOTE GETS EXCELLENT LUBRICATION AND PROTECTION. THE MOSIER REAR WILL GET EIGHT WEIGHT 90 GEAR OIL. AND TO FEED THE BEAST, SHELL URT 100 FUEL, WHICH IS A COYOTE STOCK SPEC FUEL. WHAT YOU DIDN'T SEE WAS A LOT OF WIRING TO GET READY FOR THIS. WHOO, LOOK AT THAT! (JEFF)>> FIRST TIME! DANG MAN, FIRST TIME! BY 10 ET DRAG SLICKS, AND THEY'RE MOUNTED ON FORGED ALUMINUM THREE PIECE WELD RACING 15 BY 10 RTS'S AND 15 BY FOUR AND A HALVES WITH 26 ET FRONTS. COME ON DOWN JEFF. THE COYOTE CLASS REQUIRES A RACE WEIGHT OF 3,150 POUNDS WITH THE DRIVER. WHAT DO YOU CALL IT? (JEFF)>> 28 ON THE NOSE. (JEFF)>> GAH, PRETTY GOOD, SIX POUNDS SHY. 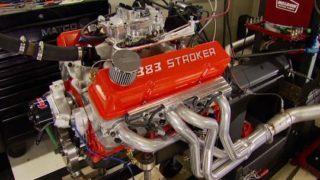 (MIKE)>> REMEMBER, THIS ENGINE WAS TUNED AND SEALED FOR DRAG RACING. THERE'S NO TWEAKING ALLOWED. BEST RUN OF THE DAY. (JEFF)>> WHAT DID IT GO? 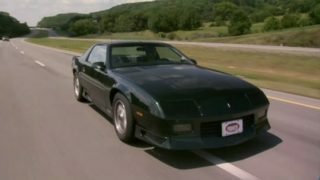 (JOE)>> THE MUSTANG'S READY, HOW ABOUT JEFF? (JEFF)>> THOSE GUYS ARE PRETTY SNEAKY AND THEY'VE BEEN DOING IT SEVERAL YEARS. I'M KINDA NEW AT IT. I MIGHT HAVE TO GO AND LEARN BEFORE I CAN START ACTUALLY TEACHING. HE WON'T BE ALONE. AT THE FIRST COYOTE RACE IN 2012 ONLY TWO CARS WERE REGISTERED. THE FIRST RACE OF 2013 SIX WERE REGISTERED AND OVER 20 ENGINES SOLD.